Custom fusion of the Treble & Mid-Range Alt '88 Pickups, introducing the new 'Twin Sound' for Jaguar. Scatterwound inner coil with a tightly wound outer coil for a versatile coil-tapped Jaguar Pickup Set. The Alt '88 pickup was inspired by the alternative music scene of the mid-to-late '80s and after feedback from Jaguar players the design has not only been split into two distinct versions, I've also designed the new 'Twin Sound' version for a more versatile pickup with a wider range of sounds. The brighter sounding Alt '88 inner coil that becomes fatter, fuller with more-mid-range and a higher output with the added outer coil. Scatterwound inner coil with a tightly wound outer coil pressed around the custom designed magnets and wax potted in a combination of paraffin & beeswax, the Alt '88 'Twin Sound' pickups for Jaguar give the two distinct voices for indie/alternative playing in one replacement Jag pickup. With simple push/pull pots (or my preferred push/push pots) you can have the brighter, more abrasive Alt '88 'Treble' sounds - then with simple switching you have a fatter, fuller, rounder, more mid-range version with a higher output for a more versatile guitar. The idea came when collaborating with a well-known Jaguar guitarist on a completely new, custom design - working on a new switching system to allow push/push pots to combine a classic bright Jag sound with the fatter, fuller, stronger alternative Jag sounds with more mid-range that he wanted for studio & live work. I took this idea to the Alt '88 range for a new coil-tapped design. Not everyone has two Jags so if you're looking for more versatility and a wider pallete of sounds, from bright to mid-range - then maybe the new 'Twin-Sound' range is for you. With two concentric coils, the inner is wound with standard 42awg coil wire to give you the bright, rich, single coil Alt '88 'Treble' sound whereas the outer coil is wound with much thinner 44awg to add more mid-range and change the overall sound to a much fatter, fuller, warmer voice with a noticeably higher output to push more - So with the flick of a switch or push of the pot you can suddenly drive & push the sound more. Available in Alnico 2 for a slightly warmer overall sound or Alnico 5 for a slightly clearer, more defined, attacking sound, I spent a long time getting these new 'Twin Sound' coil tap Alt '88 pickups just right. Alnico 2 works well for the bridge but with the naturally darker neck position, I tend to prefer the stronger ALncio 5. Please Note: These aren't hum-cancelling pickups, they have 2 coils in a concentric/coaxial design. I've designed these to work well with 500k push/push or push/pull pots - 1 meg versions are available but due to the design and custom magnets I've had manufactured, and after extensive testing, I just preferred the 500k versions. Use one for the volume & one for the tone - that way the coil taps work seperately for bridge & neck giving you a wider range of sounds. 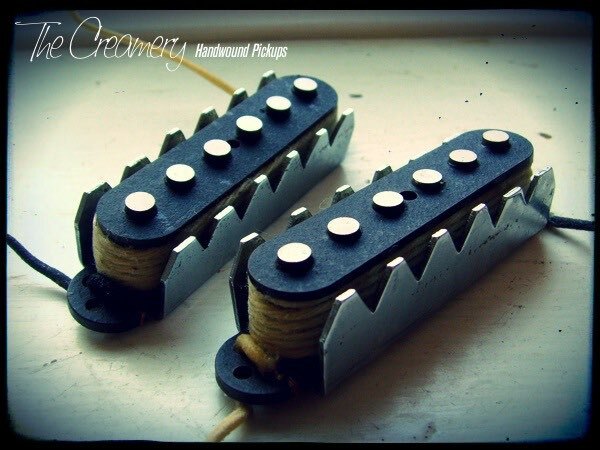 You can find more details of my Creamery Custom Shop Handwound Replacement Jaguar Pickups here.